Designed for small block Chevys, these pulleys have a 1, 2, or 3-groove configuration for both the water pump and crankshaft locations. 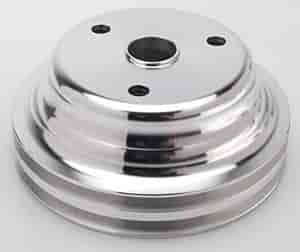 Water pump pulleys feature lightening holes and a satin finish. Alternator pulleys and a water pump nose cover, which conceals the end of the pump shaft, are available separately for GM applications. All are heat-treated for durability. When not using a conventional fan, use 720-5321 to install your water pump pulley. Does Mr Gasket 5317 fit your vehicle? What is the diameter of this pulley?